Before the NCAA Division I Cross Country Regional Championships take place, many schools from around the country will compete for bragging rights at their conference cross country championships this weekend. Several conferences will see some heated action with many of the USTFCCCA Top 30 teams set to face off against one another. One of the more intriguing conference meets should be the Pac-10 Championships as top-ranked Stanford and second-ranked Oregon go head-to-head this weekend in the men’s championship. Stanford has been on top for many weeks now, but Oregon remains in close range and is the three-time defending Pac-10 Champions. Also set to compete at Pac-10s this weekend is No. 13 Washington, No. 16 Arizona State, and No. 26 Washington State. On the women’s side of the Pac-10 top-ranked Washington looks to repeat after dominating much of the competition this season. No. 8 Oregon and freshman sensation, Jordan Hasay, should push the Huskies for the title. Over in the Big East Conference competition should be as fierce as ever with five ranked men’s squads and six women’s ranked teams battle for the Big East Crown. Leading the charge for the men is No. 10 Georgetown (seeking their sixth-straight team title), followed by No. 14 Syracuse which could push for the overall team title. On the women’s side No. 2 Villanova (last year’s champion) leads the way followed by the Mountaineers of West Virginia at No. 4, Georgetown at No. 9, and Syracuse at No. 10. The Big Ten Conference should be very competitive on the women’s side with six teams ranked in the women’s top 30. Illinois (No. 13) is the favorite, followed by No. 15 Minnesota, and No. 18 Penn State. In the Big 12 Conference, individual status is a buzz with All-Americans Jenny Barringer (Colorado) and German Fernandez (Oklahoma State) set to compete. Barringer, completing her final year of eligibility on the cross country scene looks to win her first-ever individual Big 12 Cross Country Title. Fernandez, last year’s men’s champion, aims to become the fourth Big 12 student-athlete to win back-to-back cross country individual championships after winning last year’s title as just a freshman. 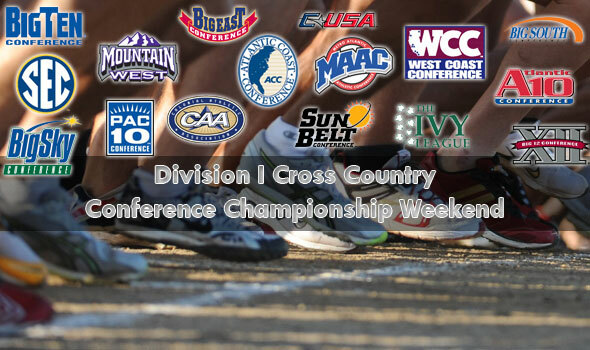 For complete results from all of the Division I Conference Cross Country Championships visit – www.ustfccca.org/weekly-results.